This is a behind the scene look on how the Nine Lives Popper came to life. The end product you see took several months of work by several people. We hope you enjoy this step by step process. 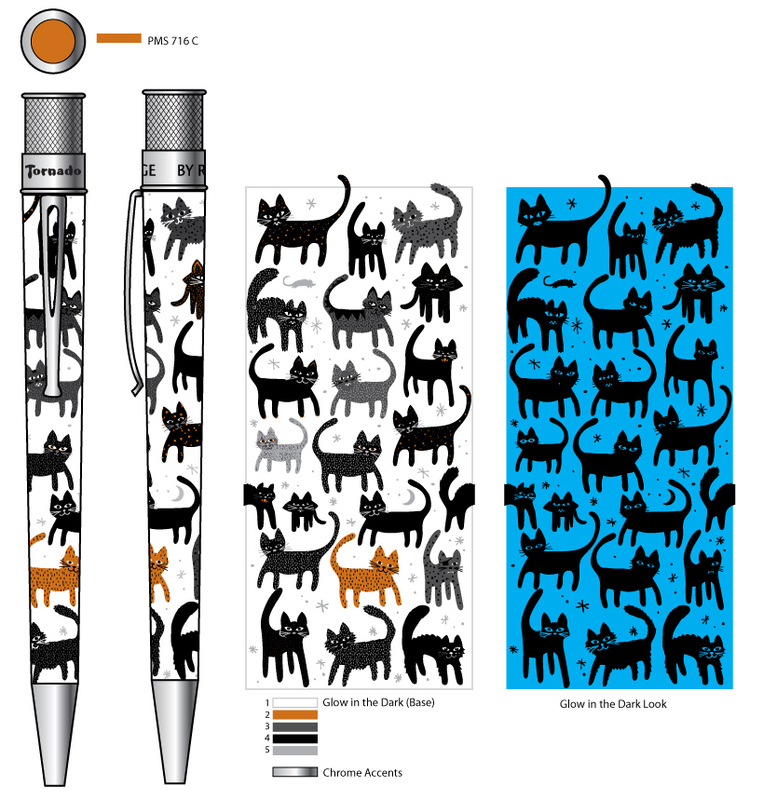 The first step in designing any Popper is coming up with a concept, this one was of course cats. 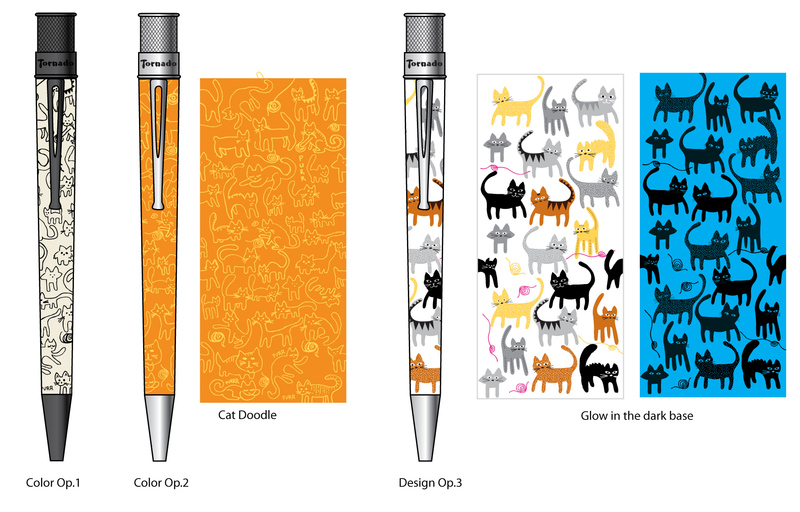 The cat theme was proposed with several other themes to the product development team to gauge an interest. From there, I start working on how this pen will be stylized. 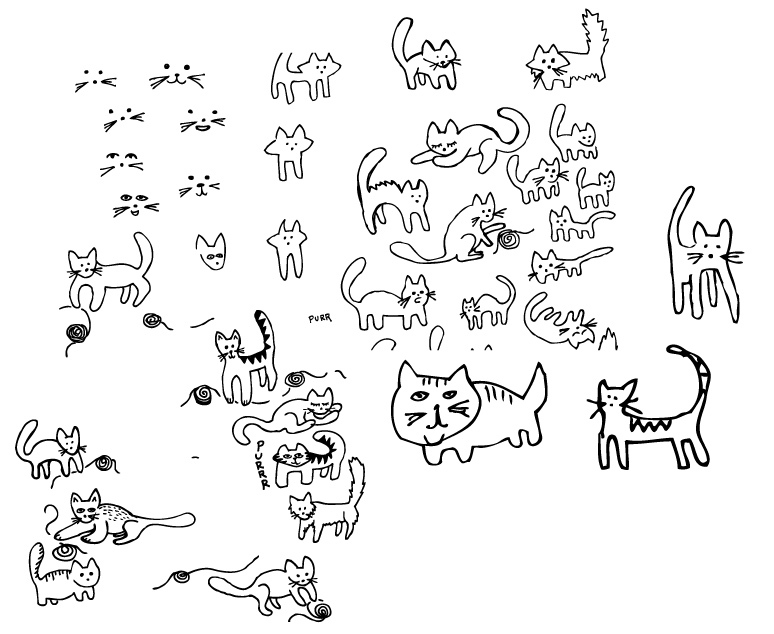 For the cat pen, several doodles and sketches were drawn (with a Tornado of course). They were rough drawings, but I scanned them and turned them in vector based artwork. That’s when color was brought into the design. After playing with the original doodles I presented two rough ideas , plus three different looks. From simple to more complicated, everyone has different tastes, so I try to cover a broad range. The first sample came in and they looked great! Sometimes colors need to be changed or an art layer printed incorrectly and revisions are necessary, but this time it was “one and done.” Now it’s onto the product development team to see if it’s cool enough to produce for the Popper line. After more scrutinizing, we all agreed that the “cat pen” was going to be a Popper! Now onto the next steps, because yes there are more! First, we need an official name and then we need a packaging label. Several names were thrown out including: BOO, Superstitious, Tom Kat, but Nine Lives was the winner. 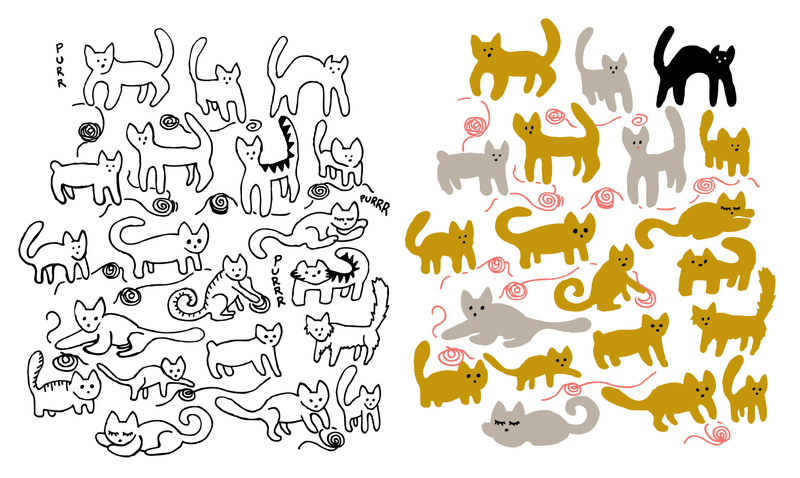 Since the cats were hand drawn, I felt the name should have the same rough, hairy, fun feeling to match. I hand drew all verbiage and repeated the same process for the name as done for the pen. After approval from the team, it’s sent out for production and a sample comes in for our review. Finally after weeks of production, the product is delivered and the final step of making a sale sheet (this one was an animated version), photographing the product plus writing sales copy is done. 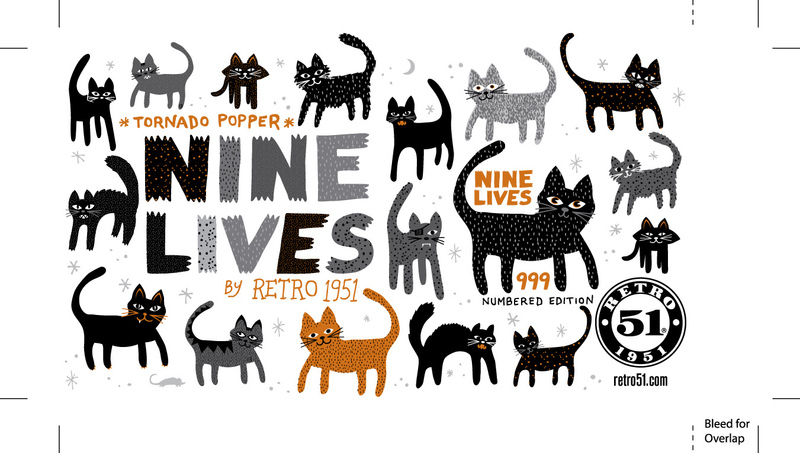 After several months of work, the Nine Lives Popper was released to our retailers for sale. The design process is complete, but the promotion, sales and customer service support are more steps to complete the Popper release. On the design side, it’s back to square one. Time to create another design fast, pronto, like yesterday! The best part of the process is hearing our customers response to the designs. It makes the months of work worthwhile knowing that someone cherishes this pen and it brings them such pleasure. We hope you enjoyed this behind the scenes look at Retro 51’s design process. Questions? Comments? We’d love to hear from you. Thank you so much for sharing your process! I like twisties more than poppers, but I love the cat design and will definitely be adding one to my collection. 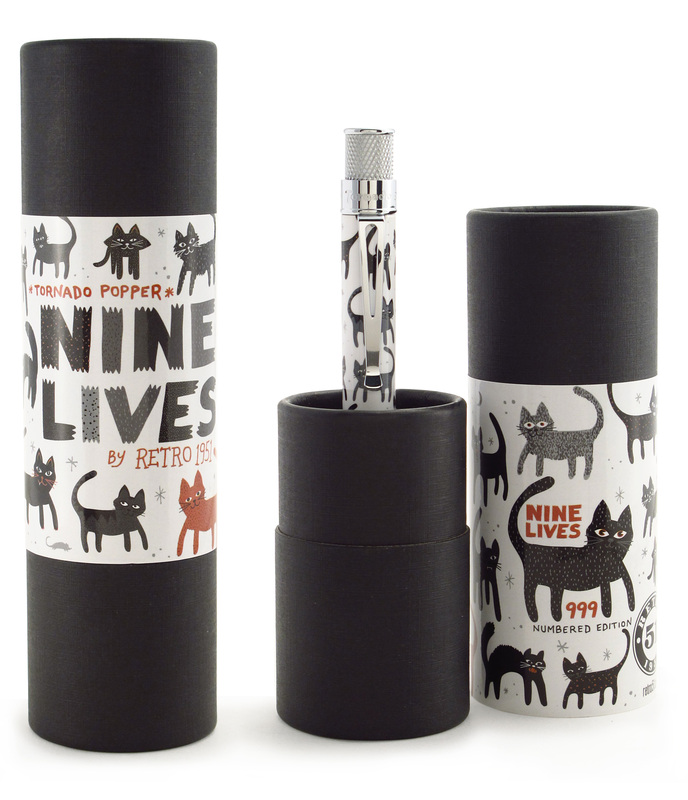 FYI, the Nine LIves is a twistie 🙂 or a twist-top rollerball. Only the “Snappers” are the click-top ballpoints. Birds would be a fun one! Very interesting! I had no idea of the process so it is good to know what all goes into the making of a pen! That was super interesting and informative. I would love dogs, birds or bicycle design. LOVE IT! Thank you so much for adding to my pen collection/addiction. Any plans to increase production on this pen? It’s sold out on all websites and even has increased pricing on Ebay. I would like to buy this for my wife but don’t see any supply.